Marketers design website landing page forms to collect emails to grow their marketing lists. Sadly, landing pages are donkeys. Between 1% and 5% of people who visit a web page will typically convert by completing a form and submitting their info. 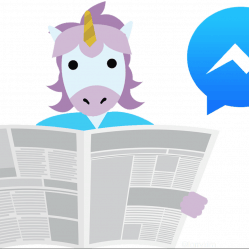 Facebook Messenger offers an incredible unicorn advantage of instant lead capture from 100% of new contacts. That means you can explode your lead volume simply by moving your traffic-driving efforts from your website landing pages to your Messenger lead magnets. 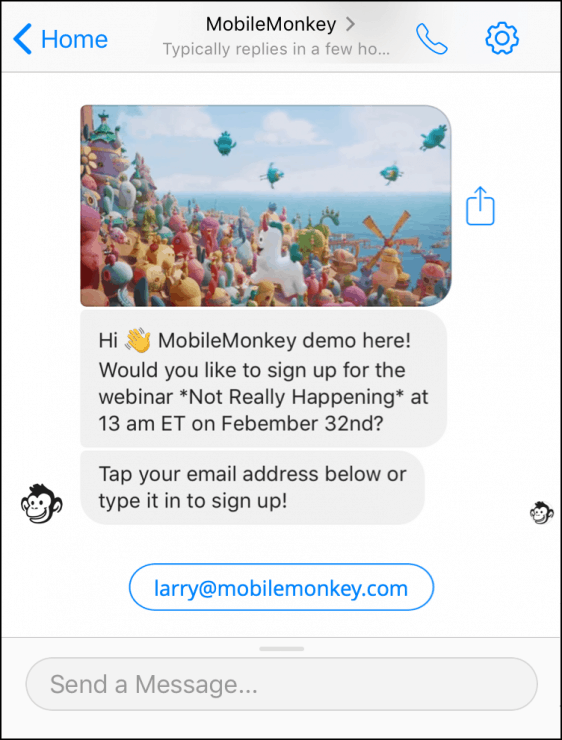 Today I want to show you 8 remarkable lead magnets built right into MobileMonkey’s Facebook Messenger marketing automation platform. Combine lead magnets with countless, proven lead gen strategies for maximum impact. Read on to learn the secrets of 100% conversion rate with MobileMonkey’s Facebook bots. How Can a Marketing Channel Have 100% Conversion Rate? Back up. 100% conversion rate is too good to be true. What are you even talking about, Virginia? Check it out. When someone messages your bot in Facebook Messenger, Facebook gives you their info and a direct line to stay in touch with them! Instant lead capture! First and last name, their locale, gender and permissions to follow up! After someone messages your bot through the entry points laid out here, they automatically become a lead in your contact database. Set up a Messenger drip campaign to welcome and nurture them. Ask them questions to qualify them and see if you’re a good fit. Invite them to stay in touch as a subscriber. Send them info about your products, services and promotions. Heads up, you want to become familiar with Facebook’s rules for Messenger engagements. There are rules like when and how you can send sales messages, for instance. More about Facebook Messenger rules here. Now let’s jump into the lead magnets where every initiated contact is a lead! Facebook post comment guards (aka Facebook post auto-replies or private replies) are the most engaging, free way to get new contacts! 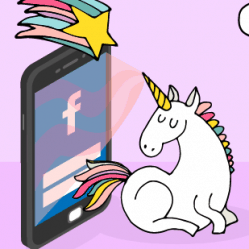 You can take ordinary, donkey Facebook posts are turn them into unicorn lead-capturing tools. Test out this Facebook post autoresponder for yourself by commenting on this post. They turn your engaged Facebook fans who are commenting on your posts into contacts! Your Facebook page listed response time drops dramatically — a great trust signal! You turn your page fans into leads you can send follow-up messages to! Lead qualification: Use a comment guard on a Facebook post that asks people to comment to get a resource, guide or download. Set up the chatbot response to ask qualifying questions of your new contacts so you can score your leads! Want to set up your first autoresponder today? Follow our easy, four-step guide and you’ll have one running in minutes. 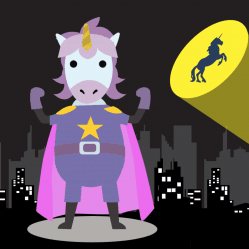 And be sure to check out 5 Unicorn Facebook Post Autoresponder Examples to get your brainstorm on. Including chat on a website can increase conversions by 45%! Use your Facebook bot to power your website chat and see key advantages — at the top of the list are new contacts you can send messaging to! Answer FAQs instantly: You can answer common questions with a chatbot in seconds, giving visitors on your site immediate answers to keep them around. Save on staffing: Using automation and chatbots, you save tons of money on staffing costs. Alert a human to take over the chat any time: Get the best of all world’s by setting up your website chat to have a human takeover if questions can’t be answered by the bot. Mobile friendly: Messenger is meant for mobile communication, there is no better way to communicate on mobile with your customers. Save new contacts as leads: When you get a contact on Messenger, you can message them at any time, even if they leave your website. But with live-chat platforms, you can’t message them unless they are on-site! You can install Messenger chat directly to your website in seconds using Google Tag Manager and MobileMonkey. Test it out yourself by tapping the Messenger icon in the bottom right of this page and any page on MobileMonkey.com. 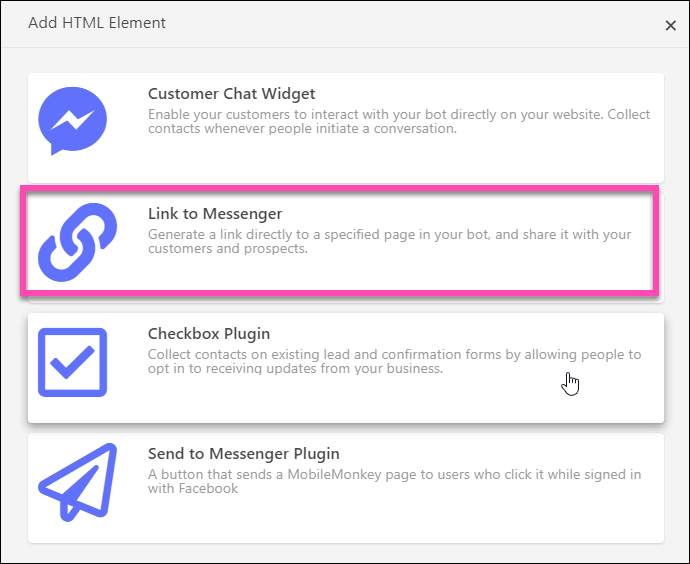 To install the Facebook Messenger chat widget on your site, create a new HTML element and paste the code into Google Tag Manager based on whatever rules you want (which pages to show on, etc.). That’s it! Now you can chat with customers immediately from your website. Here’s How to Add a Facebook Messenger Chat Widget to a Website via Google Tag Manager. 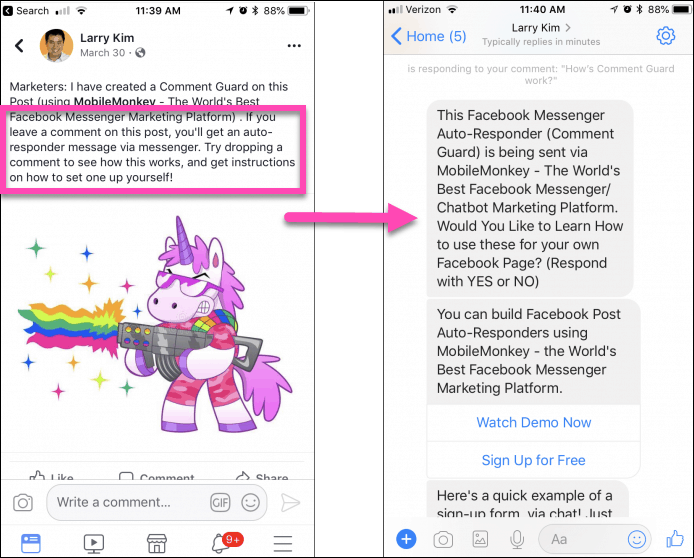 These next three strategies use Facebook click-to-Messenger Ads, a lead magnet powered by Facebook’s advanced audience targeting options. We’ve reduced our cost per lead 95% using the messages Facebook ad objective compared to traffic and conversion ads. They’re a new ad objective which gives marketers who do adopt them a first mover advantage. Instead of traditional Facebook ads that drive clicks to a website or likes to a page, messages ads start conversations in Facebook Messenger! Experience a Facebook ad that sends to Messenger by clicking “Show in News Feed” here. Make a messages ad campaign in Facebook Ads Manager. Design your copy and creative in Ads Manager. Design a chatbot funnel in MobileMonkey Bot Builder. Create the MobileMonkey code in MobileMonkey Lead Magnets. Paste the MobileMonkey code into the Facebook ad. One strategy for creating new contacts with click-to-Messenger ads is to convert your email contacts into Messenger contacts. 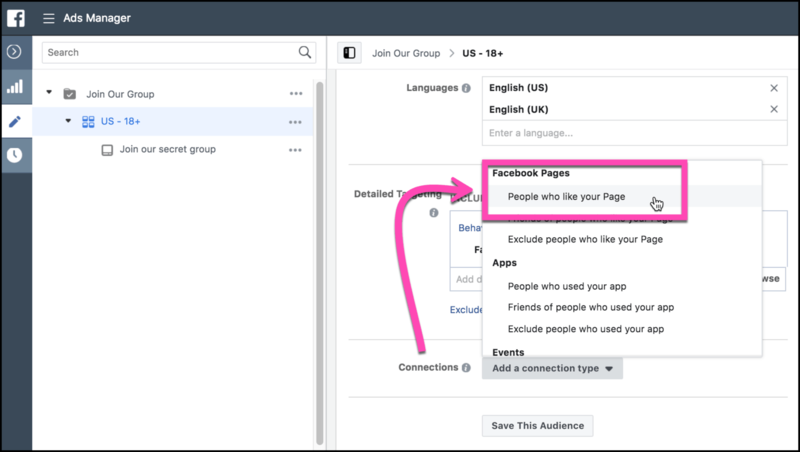 Create a Facebook custom audience in Ads Manager from your email list. 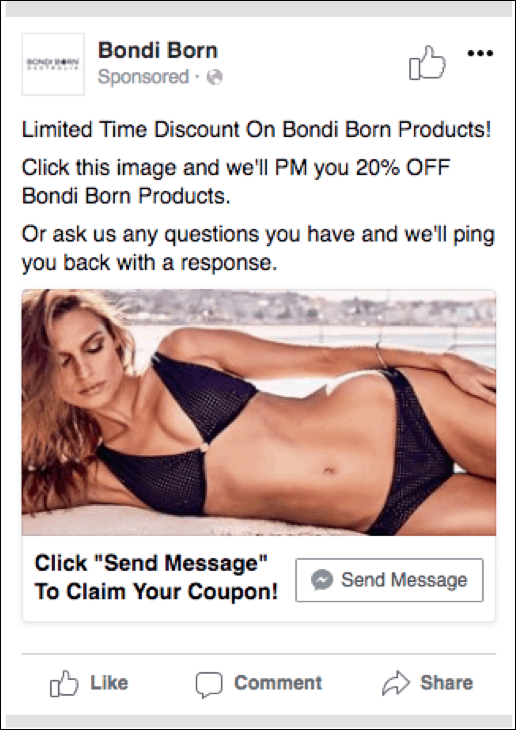 Run a Facebook click-to-Messenger ad campaign with your custom opt-in dialogue as the landing page. Get 100% conversion rate as clicks on your ad send a message to your bot! Read all about Facebook Messenger ads here. When you’re looking to make new contacts, your own Page fans are a smart audience to target. Since they’re already following your business on your Facebook Page, they’re probably open to receiving messaging from you. Facebook Messenger is a more productive place to engage than Facebook because you can send messages directly to their Messenger inbox rather than hoping your posts show up in their organic news feed. Read all about how to convert your Page fans into Messenger contacts, via Facebook ads plus two more methods, here. 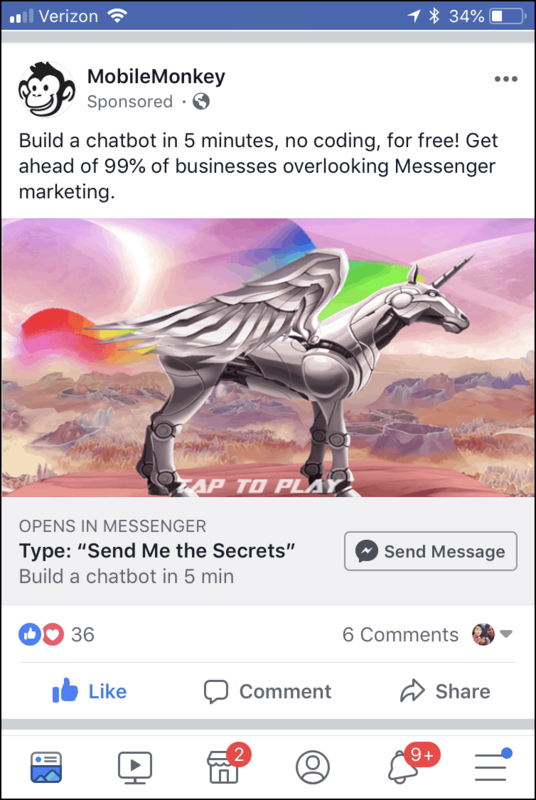 Send-to-Messenger ads are amazing for contacting new audiences and building some brand awareness. But they are even better when you start to target warmer audiences that have engaged with your brand before. MobileMonkey users who utilize this strategy are seeing 20% response rates within a single hour of launching these campaigns. Yes, that’s response rates or click-throughs, not open rates! To do this with MobileMonkey, create a custom engagement audience of website visitors. 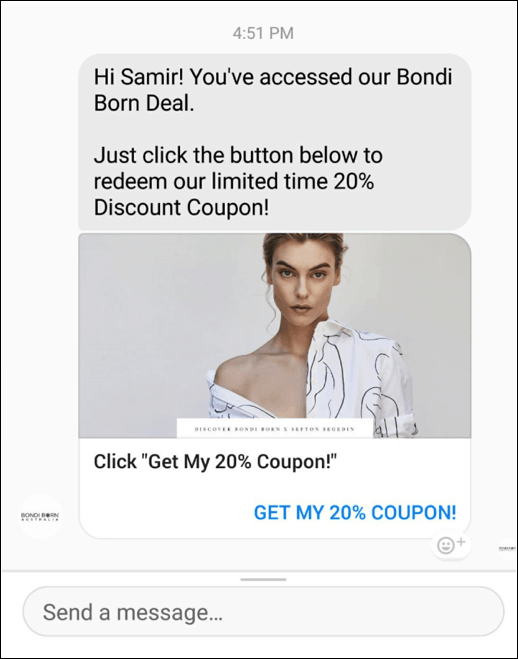 For a guide on creating amazing send-to-Messenger ads, read more here. Standard landing page conversion rates are in the neighborhood of 2.5%. 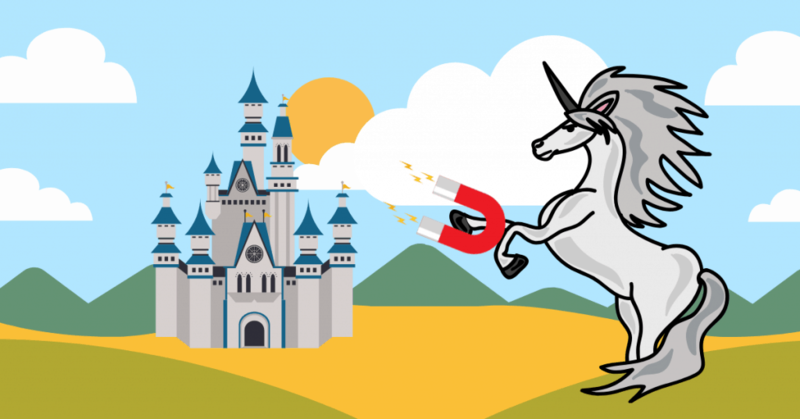 But with MobileMonkey Messenger landing pages, you get unicorn conversion rates — everyone who clicks the button and sends your bot a message becomes a lead. Click here to see the live landing page and interact with it. See what happens when you click to learn more in Messenger for a surprise! 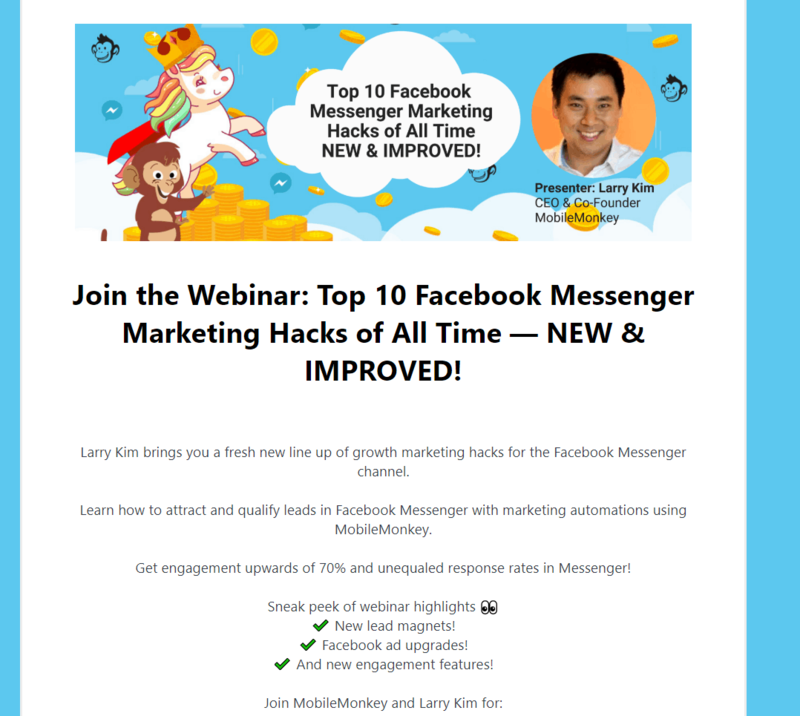 At MobileMonkey, we used this landing page to drive massive conversions on our webinar for Messenger marketing hacks. They are extremely mobile friendly, with zero forms or heavy page elements. Users get directed immediately into Messenger to convert instead. Take less than five minutes to build one in the MobileMonkey visual content builder, with zero coding. New contacts can receive follow-up messaging from you, including promotional offers, new blog posts and more. When a visitor of your landing page converts by clicking the “Learn more in Messenger” button (this CTA is customizable in MobileMonkey, too! ), they are directed into conversation with a chatbot that can collect lead qualifying information. Combining chatbots and landing pages makes for smooth, seamless conversions that collect just as much (if not more) data from your leads with less hassle. For a walkthrough on creating your own Messenger landing page, click here! These next strategies use the link to Messenger lead magnet. You can link to Messenger directly with a URL and share it anywhere in your lead gen campaigns. The next three strategies use a link to Messenger, a lead magnet that you can place anywhere you would a URL, like your blog, email or ad campaigns. Just like building landing pages on MobileMonkey, you can use them as direct links and place them anywhere you would a normal CTA. As your CTA at the end of a blog post is one obvious use case. Chatbots for Messenger are easy to develop, update, and link to for fast acting conversion tools. This HTML element generates a link directly to any specific chatbot dialogue you create on MobileMonkey! For example, you could link users directly into a lead qualification chatbot that segments your traffic. This is perfect as the call to action for your next blog post. Instead of offering a download via email gate at the end of a blog post, link folks to Messenger where they can download the resource. Learn how to set these up in just minutes with our guide here. We covered how to turn your email list into your Messenger contacts with Facebook ads, but you can also generate new Messenger contacts from email for free. How? Link to your Messenger opt-in page from your email. Leverage your existing assets to build your Messenger list faster. Read two ways to convert your email list into Messenger contacts here. Customer surveys give marketers more info about customers and their preferences that inform more effective campaigns. But surveys conducted via email are donkeys compared to surveys conducted via Messenger in a few important ways. Facebook Messenger chatbot surveys create persistent contacts that open the door to follow-up messaging. Test out the survey bot template to see how easy it is for anyone to fill out. 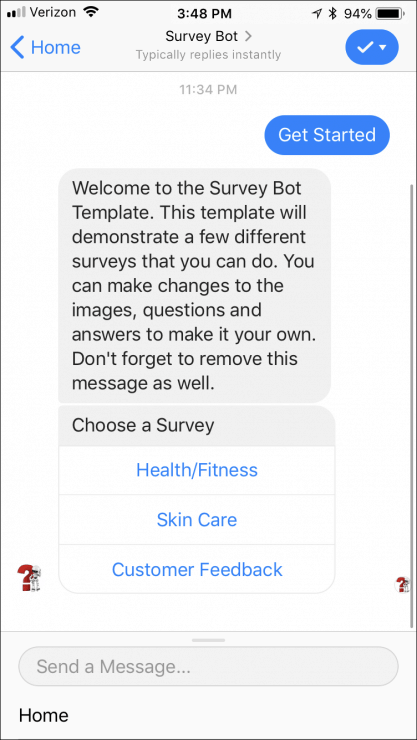 And it’s easy for you to create your next survey in MobileMonkey’s bot builder with a link to Messenger, too. Messenger can do more than just sit on your site like a live-chat plugin. In fact, Messenger can play a direct role in helping you convert more people if your forms are struggling to show high conversion rates. These checkbox opt-ins can be placed on any website form you currently have. This checkbox plugin allows you to collect more than just an email, but actually engage instantly in conversations with your customers. And in the future, you can message them anytime since they are a contact in MobileMonkey! Click here to learn more about the checkbox plugin today! There’s one more HTML Element lead magnet — the send to Messenger button. This is a simple button that you can embed on your website or blog posts that send folks who click directly into a dialogue in Messenger that you design. Name the HTML Element so you know which lead magnet this is, and be sure to whitelist any and all domains that this button might reside on. Use the drop-down selector to choose the dialogue that the user will be greeted with after they click the button. Then copy the embed code and paste it into your web page. That’s it! 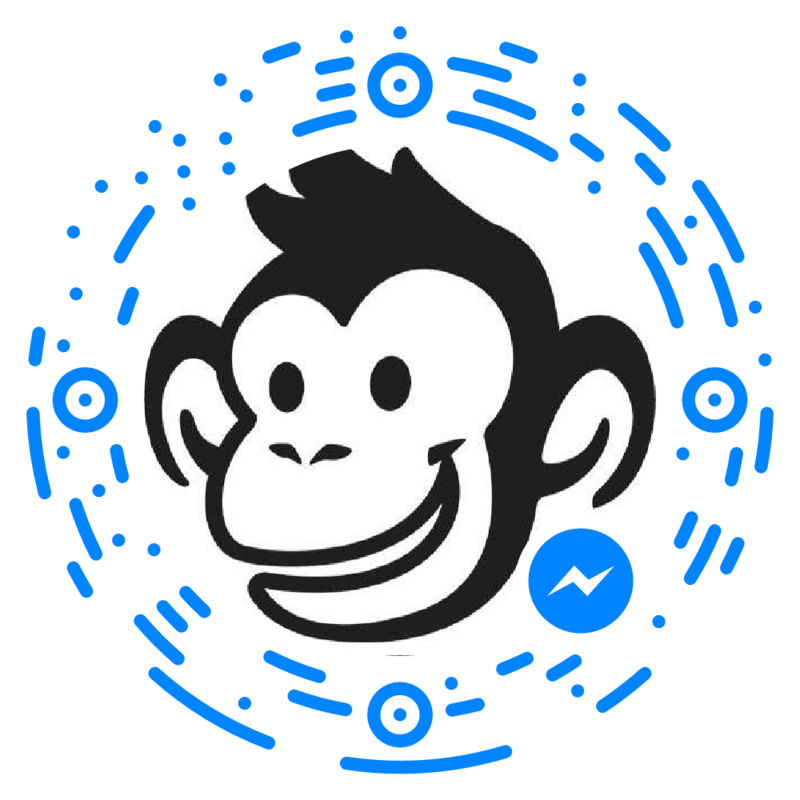 Now when you add this button to your site or partner site, people who click on it will connect with you in Messenger where they’ll become a MobileMonkey contact. 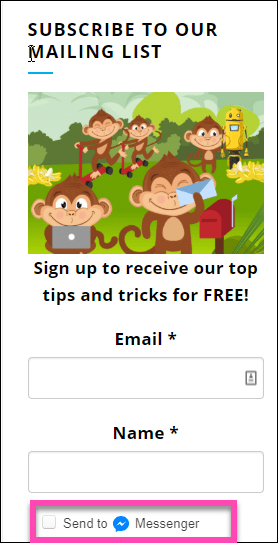 Read all about MobileMonkey HTML Element lead magnets here. Facebook QR codes, otherwise known as quick response codes, allow users to scan a code with their phone, directing them to content on a website. This popular marketing tactic can also be done with chatbots to get more contacts and leads. It’s an effective lead magnet for anywhere you have a physical presence, allowing anyone you might run into in real life to scan it and engage with messages instantly. Open Messenger on your phone. From the People tab, click the +person icon in the top right corner. Then tap the Scan Code icon. Want to create your own scan code? You can distribute them anywhere, even using them as calls to action on your email or blog posts! From Lead Magnets, click on Scan Codes. Create a new scan code and give it a helpfully descriptive name. Select which chatbot dialogue you want it to link people to when they scan it. Save it and distribute it! Scan codes are one of the advanced features available in a MobileMonkey Pro account. Lead gen is the never-ending saga of marketers. That journey is about you take you out of the dark woods of donkey land(ing pages) and into the sparkling kingdom of unicorn lead gen with Messenger bots. Remember, instant lead capture from 100% of new contacts is not a myth! It’s Messenger bots! So start sending your traffic to your Messenger lead magnets rather than to poor-converting website landing pages. 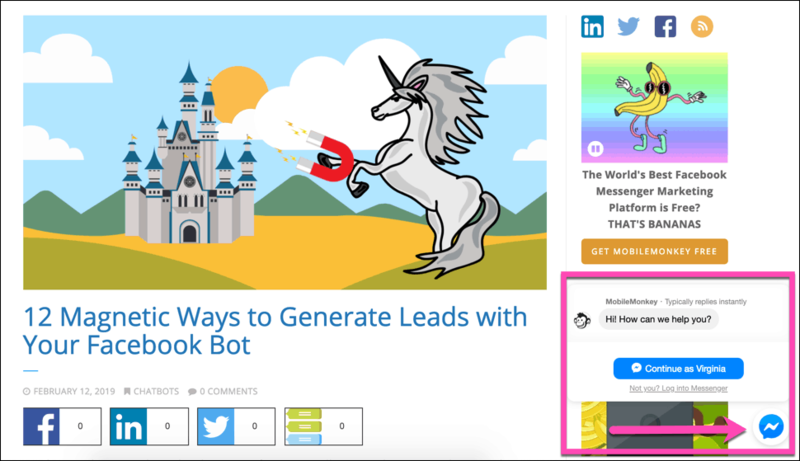 Then watch your lead volume explode with the power of MobileMonkey lead magnets! 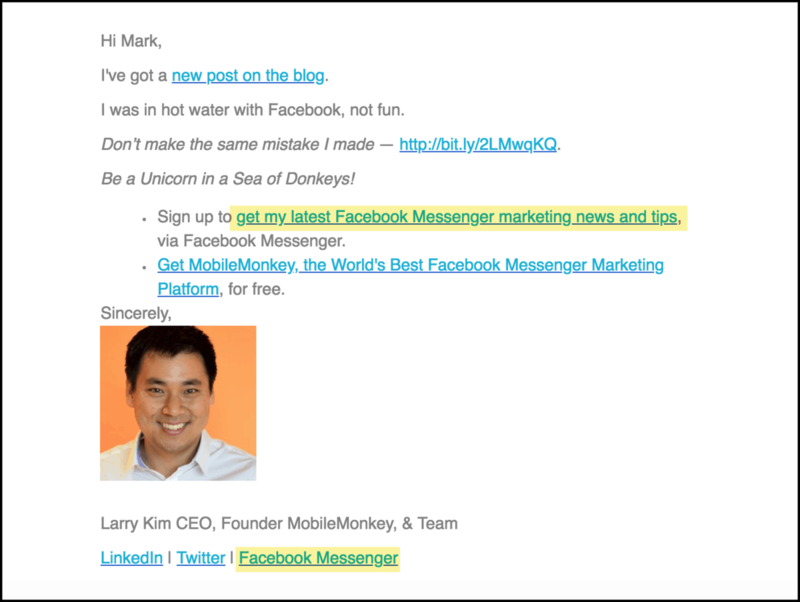 Get MobileMonkey for FREE — a non-expiring, unlimited contacts subscription. 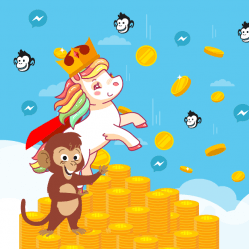 Join MobileMonkey Island and the 14,000 chatbot marketing masters in the Facebook community.